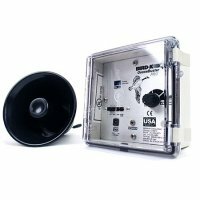 Actual Alert and Alarm Calls Recorded in the Wild - GooseBuster PRO is the first and only repeller to use actual alert and alarm calls of Canada Geese, recorded under natural conditions. Geese recognize these calls and respond instinctively (to "alert" calls indicating uneasiness about potential danger and "alarm" calls signifying immediate danger). Reacting to either, they evacuate instantly, without waiting to identify the source. Different Calls in Random Combinations - GooseBuster PRO broadcasts its calls in random combinations. Calls differ in frequency, duration and intervals. Sound combinations, sequences and speaker selection change randomly, leading geese to perceive many birds in many different locations. RANDOM PLAY - sounds are always changing, preventing acclimation. LONG TERM SOLUTION - Geese are stubborn and territorial, and return to the same place year after year. But GooseBuster PRO uses this memory against them - once scared away repeatedly, they rarely return. COVERAGE - One unit: 1.5 acres. EXTRA COVERAGE - Two units: 4-6 acres. Field tests show that a second unit increases coverage dramatically. This additive effect more than doubles the coverage (in fact it increases up to three times) reducing the per-acre cost significantly. UNSIGHTLY MESS - At least a pound of droppings per day per goose! GooseBuster deters geese with loud, terrorizing sounds, but it doesn't harm them. 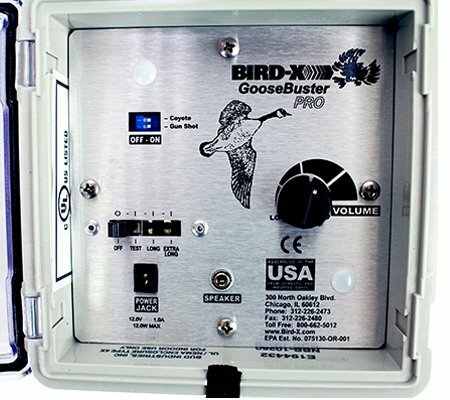 GooseBuster has been developed by BIRD-X, the worldwide leader in bird repellent products and systems. 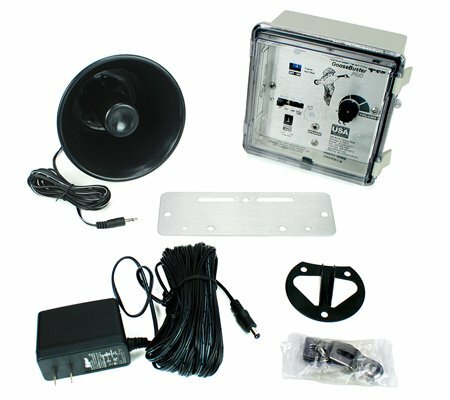 Dimensions: Control Unit - 6" x 6" x 3.5"
Speakers - 5.5" x 5.5" x 5"
What is included? : Control Unit, one speakers with 10' cord, mounting hardware, Instruction Manual, AC power adaptor with cord.